(nicknames) the Celestial One, the Devil Doctor, the Prince, "Yellow Uncle"
Powers/Abilities: Fu Manchu is an exceptional genius in virtually every field of human knowledge, and employs hundreds of skilled engineers and biologists to assist him in developing his inventions. Electronic marvels used (and often built) by Fu Manchu include several flying saucers (used to exploit paranoia), the Runsen Beam, the Ericksen Ray, sonic weapons, electronic force fields, and an anti-gravity device. Fu Manchu is a skilled medical practitioner and surgeon; he has also cultivated a number of viruses and diseases to use against enemies, including leprosy and the "Black Stigmata" carried by fleas which could place its victims into death-like comas. He has also developed fungus that can spread so quickly that it can entrap a full-sized human being and smother him to death. Chemicals developed by Fu Manchu include the Green Mist; a memory-removing drug; the Golden Mist; swamp adder venom; mimosa, which relaxes the minds of its subjects, making them completely pliable to Fu's needs; and Kaapi. He also makes frequent use of hashish and opium (for personal use). Fu Manchu has conquered alchemy, and has used its secrets to maintain his fundings. Fu Manchu's employs the Elixir Vitae, a concoction which can prolong the life of those who are injected with it. Fu Manchu is virtually immortal due to repeated injections. Although he requires a new injection at least every 10 years to prevent death, the chemical has enabled him to survive multiple stabbings and bullet wounds. Although Fu Manchu is well over 100 years old, he appears physically to be within his 40s. Fu Manchu keeps a number of rare animals within his labs, and has experimented to make these creatures larger and more deadly than they would be in nature. His subjects include the "Zayat Kiss" centipede; giant spiders (one said to have almost human-level intelligence); scorpions; pythons; hamadryads; giant wasps; giant sandflies; lycoperdon; empusa; amanita; Siberian manitamuscania; Mexican morsitans; katigo; "Scarlet Brides"; and some animal-human hybrids. Fu Manchu is also a master of disguise; despite being Asian, he can pass for a member of almost any race thanks to his linguistic skills (he can speak most languages without hint of an accent). His only distinguishing features are his emerald eyes and claw-like hands (which he conceals behind sunglasses and gloves in some disguises). He has been described as physically resembling both William Shakespeare and Pharaoh Seti. He is over six feet tall. Fu Manchu is a master of unarmed combat, trained at the Tibetan monastary Rach� Churân. Fu Manchu's greatest power is his mastery of hypnosis; his eyes are so powerful that few men can gaze into them without falling under his spell, and he can command men to commit murder, suicide, or theft, and not retain any knowledge of who he is and what they have done. He can also hypnotically conceal himself from the attention of others in order to escape enemies. History: (Master of Kung Fu I#124 (fb)) - Fu Manchu gained his education in the monastary of Rach� Churân, learning martial arts, arcane knowledge, and every discipline of the sciences. He was highly regarded in the monastary, and considered part of their brotherhood. He finally left the monastary to share his "gifts" with the world. (The Mystery of Dr. Fu-Manchu) - Fu Manchu became president of the Si-Fan, but was believed by the outside world to be a part of the "young China" movement. He sought to restore to China the glory of the Manchu dynasty he represented, and ultimately conquer the entire planet. (Master of Kung Fu I#48 (fb)) - When his daughter Fah Lo Suee was a young child, Fu Manchu once showed her the moon, and told her that one day he would have the power to move one world in order to rule another. (The Mystery of Dr. Fu-Manchu/Master of Kung Fu I#18 (fb)) <1911> - While in Rangoon, Burma, British agent Sir Denis Nayland Smith was nearly killed by one of Fu Manchu's agents. He began an investigation of Fu Manchu, and became aware of the threat he posed to the world at large, and England in particular. (The Mystery of Dr. Fu-Manchu) <1913> - Fu Manchu became active in England, sending his subjects to murder people with the "Zayat kiss," a giant poisonous centipede. Sir Denis Nayland Smith enlisted his friend Dr. Petrie to aid him. Together, they found an ally in Fu's own servant girl Kâramanéh, who spared Smith and Petrie's lives. Fu Manchu also made attempts on the lives of Sir Lionel Barton and Reverend J.D. Eltham. In an altercation with Inspector John Weymouth, Fu Manchu injected him with a poison that drove him insane. Fu Manchu attempted to disguise himself as Professor Jenner Monde, but was found out and detained by Nayland Smith. They arranged to have Fu supply an antidote to Weymouth while under police guard, then set a fire. The police found no trace of Fu Manchu, but he left behind a letter for Smith and Petrie, saying he had been summoned back to China. (The Return of Dr. Fu-Manchu) <1916> - Fu Manchu used hypnosis to force Kâramanéh back into his service and returned to directing the murders of his enemies, using exotic means such as a cat with poisoned claws, and a "Moses" rod (a cane with a death-adder hidden inside). Smith and Petrie again opposed Fu, and Petrie attempted to break through Kâramanéh's conditioning. Fu Manchu was due to join the Sacred Order of the White Peacock, but lost a white peacock which he was to have presented to the order's "Sublime Prince." Petrie found it and returned it to the doctor, saving his and Smith's lives. Smith and Petrie were finally captured, and Fu Manchu had Smith placed within the "Six Gates of Joyful Wisdom," in which he would expose parts of Smith's body to hordes of starved rats, and gave Petrie a sword to relieve Smith's suffering. However, Kâramanéh burst in and shot Fu Manchu in the head. (Si-Fan Mysteries) <1917> - Fu Manchu survived and had servants recruit Petrie and Sir Baldwin Frazer to operate on him and remove the bullet. Fu Manchu found that his death had been ordered by the "Sublime Prince" of the "Sublime Order of the White Peacock." Fu's rival Ki-Ming hypnotized Petrie and ordered him to kill Smith, but Smith unloaded Petrie's gun and broke the spell. At one point Petrie spied upon a meeting of the Si-Fan, and had an opportunity to capture Fu, but gave it up when Fu returned Kâramanéh to Petrie. While fleeing England in his yacht, Fu Manchu's ship was wrecked, and he was believed lost at sea. (The Golden Scorpion) <1918> - Fu Manchu met with his ally (and possible Si-Fan member) Fo-Hi, and viewed Miska, Fo-Hi's slave girl. Miska later divulged that Fo-Hi was to the eastern world what Fu Manchu was to the western. (The Daughter of Fu Manchu) <1930> - Fah Lo Suee assumed leadership of the Si-Fan and all of her father's servants, clashing with Smith, Petrie and Shan Greville, but ultimately Fu Manchu stepped in and prevented her from killing Smith and Greville, then resumed leadership of the Si-Fan. (The Mask of Fu Manchu) <1932> - Fu Manchu and Fah Lo Suee attempted to obtain the holy relics of El Mokanna to start a holy war, clashing again with Smith, Petrie, Greville, and Sir Lionel Barton. Fah Lo Suee succeeded in stealing the relics by hypnotizing Greville. (Master of Kung Fu I#100 (fb)) <1932, May 23> - Fu Manchu was revealed to have knowledge of the methodology of Jack the Ripper, possibly having created him himself. He plotted with the Si-Fan to duplicate the mental conditioning on Nayland Smith when Smith was found spying on their gathering. Smith was saved by the arrival of Lyman Leeks and Dr. Petrie, and Fu suspected that Fah Lo Suee had betrayed him. (Master of Kung Fu I#81 (fb)) <1933> - Fu Manchu kidnapped Kâramanéh as he was in the process of using mind control devices to manipulate representatives of the League of Nations. He was thwarted by Smith, Petrie, and Lyman Leeks. (The Bride of Fu Manchu) <1933> - From St. Claire de la Roche, Fu Manchu prepared Dr. Petrie's daughter Fleurette to become his bride, but Fah Lo Suee was against the arrangement. When Petrie was seemingly killed by the "Black Stigmata," his friend Alan Sterling became embroiled in Fu Manchu's plots, and avoided an attempt to be drugged into Fu Manchu's service by Fah Lo Suee. When Fu learned that his daughter had betrayed him, he had her beaten. Fu Manchu was pursued by Nayland Smith and captured by French authorities, but declared himself above the law. When his lawyer Maître Foli came to see him, they traded clothes and Fu escaped custody. (The Trail of Fu Manchu) <1934> - Still intent on having Fleurette as his bride, Fu Manchu kidnapped and smuggled her to England, keeping her in slumber as a "statue" while he was in the guise of the Italian sculptor Professor Pietro Ambrose. He then traveled through England as the Marquis Chang Hu, meeting with men of influence. When Fah Lo Suee betrayed him, Fu had her killed. Requiring another injection of the Elixir Vitae but unable to supply it, Fu offered to release Fleurette and leave Petrie's family in peace if he would concoct an injection and supply him with it. Petrie did so, and Fu was good to his word, releasing his mental hold over Fleurette. (President Fu Manchu) <1936> - Fu Manchu engaged major operations on U.S. soil as he funded the League of Good Americans through the Si-Fan, attempting to control who would be elected the next President of the U.S. He clashed again with Nayland Smith, and his sponsorship of the League's leader Paul Salvaletti was revealed to the public by Abbot Patrick Donegal. Fleeing to Canada with his staff in a boat, Fu's supposedly loyal servant Albert Morgenstahl turned on him, and their boat was seen plunging over Niagra Falls. (Master of Kung Fu I#44 (fb)) - When Fu Manchu's servant Ducharme attempted to flee from Fu with her lover Pan Chen, Fu captured them and killed Chen. Ducharme seemingly became a double agent for MI-6 as a result, but in reality remained loyal to Fu Manchu. (The Drums of Fu Manchu) <1939> - Fu Manchu attempted to halt World War II from breaking out by assigning the Si-Fan to assassinate the fifteen men who could set it in motion, unless each of those men would submit to the Si-Fan. When Nayland Smith became involved in the conflict, he was added to the Si-Fan's list of targets, but was ultimately released. Fu Manchu used the aliases of Count Boratov and Dr. Maurice Atkin to walk amongst his intended victims. (The Island of Fu Manchu) <1941> - Claiming to be "Damballa" and employing a resurrected Fah Lo Suee as "Queen Mamaloi," Fu Manchu recruited followers in Haiti, and set up an elaborate Si-Fan headquarters at Christophe's Citadel. He clashed with Smith and Bart Kerrigan, and offered Kerrigan a place with the Si-Fan, but the Citadel base was destroyed when Fu's Ericksen ray attracted a bolt of lightning that destroyed the base. (Master of Kung Fu I#114 (fb)) <1942> - Fu Manchu took the woman Mara Ling to be his wife as part of an arranged marriage, but she loved a blind archer named Li. She refused to sleep with him until he offered her the Elixir Vitae. She took the drug and slept with him, then attempted to give the potion to Li. Fu Manchu sent a Si-Fan to pursue him, and the chase continued for decades. (The Shadow of Fu Manchu) <1948> - The Si-Fan, FBI, and KGB all sought the transmuter, a disintegrator ray, and Fu Manchu kept an eye on the inventor by assuming the guise of Professor Carl Hoffmeyer, physician to the wife of the device's funder. Fu Manchu again clashed with Nayland Smith, but avoided capture. (Re-Enter Fu Manchu) <1957> - Fu Manchu entered into an alliance with the U.S.S.R., but when their agent Josef Gorodin poisoned his supply of Elixir Vitae, he had Gorodin killed and broke off the alliance. Assuming the guise of Dr. Otto Hessian, an atomic physicist lost behind the Iron Curtain, Fu offered a powerful sonic weapon ("sound zero") to the U.S., intending for them to use it to conquer Communist China for him, and seeking an opportunity to murder the U.S. President. He was again thwarted by Nayland Smith. (The Eyes of Fu Manchu) <1957> - Fu Manchu attempted to force Dr. Gregory Allen to join him, but Nayland Smith came to Dr. Allen's rescue, and Fu Manchu fled. (The Word of Fu Manchu) <1958> - When police Sgt. Jack Kenealy infiltrated the Si-Fan, Fu Manchu became aware of his true identity, and had him killed using an electrical charge transmitted through the Si-Fan amulet Kenealy had worn. (The Mind of Fu Manchu) <1959> - Fu Manchu was revealed to have caused several UFO sightings with his technology, and stole a model anti-gravity device being developed by Bruce Garfield, unaware that Garfield's research was far enough ahead that he had almost perfected the technology. (Emperor Fu Manchu) <1959> - Fu Manchu made an alliance of convenience with Communist China, while diverting their resources into the Si-Fan, intending to eventually overthrow them and establish his own rule. He produced an army of "cold men"-- resurrected Dacoits-- in Szechuan province. Tony McKay and Nayland Smith investigated the territory over rumors of a Russian germ factory based in Hua-Tzu. Fu Manchu again evaded Smith, but Smith obtained a registry of the Si-Fan's membership, giving him the opportunity to eventually cripple the organization. (Special Marvel Edition#15 (fb)) <1959> - Smith and McKay launched their attack upon the Si-Fan, but the attempt failed, and Fu had McKay killed. He tortured Smith by having his sumo servant Tak crush his legs. (Special Marvel Edition#15 (fb) - BTS) <1968> - Fu Manchu successfully introduced schizophrenia to a gorilla, and used it as a final guardian of his New York headquarters. (Special Marvel Edition#16 (fb)) - Fu Manchu's base in Africa was struck by the British, and many of his followers were slain. He found a disfigured infant named M'Nai whose parents were killed, and realized that he could shape M'Nai into a powerful servant. M'Nai was raised alongside Fu Manchu's own son, Shang-Chi, and M'Nai was given the masked alias of Midnight as he grew into maturity. (Master of Kung Fu I#19 (fb)) - When Shang-Chi was a child, he once heard from fellow student K'uei Meng that Fu Manchu intended to rule the world. When he confronted his father, Fu Manchu dismissed it as slander. Shang never saw K'uei Meng again. (Master of Kung Fu I#25 (fb) - BTS) - Once in Shang's childhood, he saw Fu Manchu thank a Dacoit who had saved his life; years later, that same Dacoit was executed by slow torture when he failed in a mission. (Marvel Comics Presents I#158/4 (fb)) - Once in Shang's childhood, he bested fellow student Ah Lung in combat, and Fu Manchu demanded that Ah Lung be killed. When Shang hesitated, Fu had his guards step in and murder him. (Master of Kung Fu I#64 (fb)) - Fu Manchu had his pupil Shoh Teng seemingly betray Shang-Chi into the hands of MI-6 agents who were actually in the employ of Fu himself; Fu then "rescued" Shang from the agents and killed their leader, Death-Dragon, all to ensure he had Shang-Chi's trust. (Deadly Hands of Kung Fu#6/2 (fb)) - Once in Shang-Chi's childhood, Fu Manchu taught him how to combat multiple opponents by demonstrating that while a swarm of locusts might be powerful, a single locust could be crushed easily. (Master of Kung Fu I#26 (fb)) - Fu Manchu introduced Shang to Fah Lo Suee, and they had a private conversation in which Fah Lo Suee suggested that Fu Manchu might be evil, and that Shang might one day wish him dead. (Master of Kung Fu I#28 (fb)) - Fu Manchu sent Shang to another meeting with Fah Lo Suee. (Master of Kung Fu I#100 (fb)) - On one of Fah Lo Suee's visits to Honan, Fu Manchu took her lover Philip and transformed him into the Mad Slayer, using the brain patterns of Jack the Ripper. When Fah Lo Suee allowed the Mad Slayer to escape, Fu Manchu withheld the Elixir Vitae from her, but she finally won the right to continue using it when she offered to recapture the Mad Slayer. (Master of Kung Fu I#55 (fb)) - When Fu Manchu's greedy servant Han Sung attempted to steal the Elixir Vitae for himself, Fu used him as a laboratory experiment to prepare for the revival of Shaka Kharn, and left Sung ravaged by old age. (Giant-Size Master of Kung Fu#4 (fb)) - When Shang-Chi was ten, the assassin Tiger-Claw petitioned Fu Manchu to make him a lodge-master in the Si-Fan, and exhibited his prowess by killing three of Fu's best Si-Fan warriors. Fu accepted him into the Si-Fan. (Deadly Hands of Kung Fu#1 (fb)) - When Shang-Chi was fourteen, Fu Manchu tested his killer instinct by pitting him against men pretending to be British agents. Shang did not kill any of them, and it was revealed to him afterward that it had all been a test. (Deadly Hands of Kung Fu#5 (fb)) - Fu Manchu once observed a spar between Shang-Chi and his friend Kwai Loo. (Deadly Hands of Kung Fu#11 (fb)) - Shang-Chi once asked his father if he could engage in the study of philosophy; his father refused him, desiring a warrior more than a thinker. (Master of Kung Fu I#41 (fb) - BTS) - Fu Manchu seemed to test the loyalties of Shang-Chi and Midnight when his servant Kwan-Shu stole wine from Fu's cellars, apparently so that Fu could see if M'Nai and Shang would suspect each other of the deed and turn on one another. (Iron Man Annual#4/2 - BTS) - Fu Manchu dispatched Midnight to recruit the scientist Half-Face for him, but Half-Face refused to ally himself with Fu Manchu. (Master of Kung Fu: Bleeding Black (fb)) - When Li Chun, the keeper of Fu Manchu's monstrous genetic experiment attempted to free the creature from its cage, Fu Manchu allowed the creature to gore him, tearing off both of his arms. The disfigured keeper became Shadow-Hand. (Giant-Size Master of Kung Fu#3 (fb) - BTS) - Fu Manchu abducted Dr. Petrie and began to subject him to brainwashing. He placed a near-exact duplicate in Petrie's place as part of his schemes for his son. (Special Marvel Edition#15 (fb)) - When Shang-Chi was nineteen, Fu Manchu dispatched him to kill "Petrie," claiming that Petrie was a threat to peace. Shang succeeded in killing "Petrie," but Nayland Smith confronted Shang and revealed the truth about his father to him. (Special Marvel Edition#15) - Shang fought his way past Fu Manchu's guards at his New York City base, and declared to his father that from that time onward, they were enemies. (Special Marvel Edition#16) - Fu Manchu dispatched Midnight to deal with Shang-Chi. Midnight perished in combat when he fell from a crane and his cape was snagged on a hook. (Deadly Hands of Kung Fu#5 (fb)) - Fu Manchu ordered Kwai Loo to kill Shang-Chi. Kwai refused, and escaped Honan, with the Si-Fan in hot pursuit of him. (Master of Kung Fu I#17) - Tak asked for permission to set himself against Shang-Chi, but Fu Manchu declined, wishing to see first if Nayland Smith would destroy Shang for him. However, Shang and Smith wound up becoming allies. (Deadly Hands of Kung Fu#1) - Fu Manchu met with the priests who trained Shang-Chi, attempting to learn from them why Shang had betrayed him. Cho Lin suspected it was related to the test they had submitted him to at age fourteen. (Deadly Hands of Kung Fu#2) - Fu Manchu eliminated the "Past Assassins," one-time followers of his who had been cast out. (Master of Kung Fu I#18) - Fu Manchu made a deal with a gasoline company so that he could smuggle mimosa into U.S. gasoline, dispersing it through the atmosphere in smog so that he could control the minds of virtually the entire country's population. Shang-Chi destroyed the ship bearing the mimosa, and Fu Manchu directed his Si-Fan to destroy him. (Master of Kung Fu I#19) - Fu Manchu's men failed to kill Shang. Nayland Smith led a team of federal agents in an attempt to capture Fu Manchu as he fled the area, but he eluded his old adversary. (Deadly Hands of Kung Fu#4) - Si-Fan assassin Chow Loo was sent to kill Shang-Chi, but failed in his mission. When he lied about his failure to Fu Manchu, Fu had him transformed into a gorilla-like creature and sent to oppose Shang in Los Angeles, where he was killed in battle. (Giant-Size Master of Kung Fu#1) - On Shang-Chi's birthday, Fu Manchu dispatched the Council of Seven as assassins to kill his son, but each member failed at the task. (Giant-Size Master of Kung Fu#1/2) - When Shang attempted to prevent the theft of an idol from a museum, Fu Manchu stole it himself and smashed it, just to spite his son. (Giant-Size Master of Kung Fu#1/3 - BTS) - When Shang attempted to find a room to rent, Fu Manchu hired three men to assassinate him, but they failed. 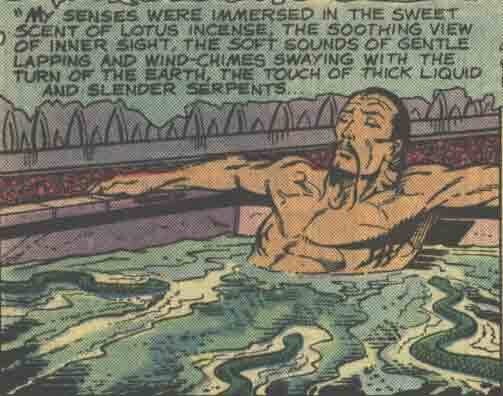 (Master of Kung Fu I#20 - BTS) - Gambler Demmy Marston attempted to claim the bounty Fu had placed on Shang-Chi, and hired Fu Manchu's one-time servant Korain to assist him, but Korain wound up perishing in battle when his supply of Elixir Vitae proved ineffective at prolonging his life. (Master of Kung Fu I#21) - Fu Manchu intervened upon Marston and prevented him from taking Shang-Chi's life. Fu killed Marston and informed his son that only he chose the moment of his death. (Giant-Size Spider-Man#1) - Fu Manchu tricked Spider-Man and Shang-Chi into battling each other while he schemed to install an aerial upon the Empire State Building that would enable him to brainwash people through television, but Spider-Man and Shang realized their mistake and alongside Smith and Black Jack Tarr thwarted Fu's plan, although Fu Manchu escaped yet again. (Master of Kung Fu I#22) - When Smith and Tarr raided Fu Manchu's New York base, his Si-Fan defeated them and he brought the two men to Mount Rushmore to set off an explosion that would kill them and destroy the monument, but Shang-Chi came to their rescue, bested the Si-Fan, and saved the mountain. (Giant-Size Master of Kung Fu#2) - Fu Manchu attempted to learn what scientist Chen Ling was developing for his enemies, and when the professor took his own life he interrogated Shang-Chi, who had heard the professor's secret. Fu set Shang against dozens of his Si-Fan and tricked him into killing the professor's daughter Sandra, but he ultimately learned that the professor's goal was synthetic food, of no use to him. (Deadly Hands of Kung Fu Special#1) - Fu Manchu employed his agents (and men hired to dress in Si-Fan robes) to kidnap members of the Chinese and U.S. delegations to the United Nations. He monitored the operations in the guise of a blind man. His plan to pit the two nations against each other was foiled by the individual efforts of Iron Fist, the Sons of the Tiger, and Shang-Chi. Fu Manchu slew his Si-Fan operatives as he escaped. (Deadly Hands of Kung Fu#7) - Fu Manchu attempted to destroy Shang-Chi with the remnants of the Past Assassins, but Shang tricked them into a fight with local criminals in San Francisco. (Master of Kung Fu I#23-24) - Fu Manchu sought an alliance with Wilhelm Bucher, who had a leftover Nazi missile at his compound in South America, but Bucher attempted to double-cross Fu, so their followers battled each other. Fu's Si-Fan were killed, but he was saved by Shang-Chi, who thwarted Bucher from using the missile. 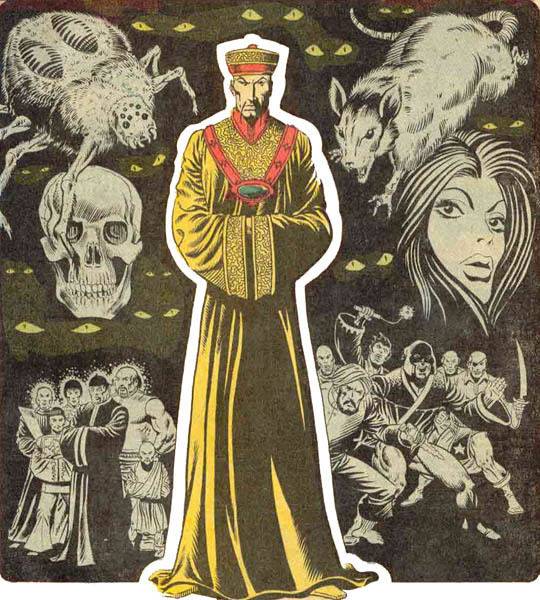 (Giant-Size Master of Kung Fu#3) - Fu Manchu had his agent Shadow-Stalker abduct Nayland Smith and bring him to a base hidden under Buckingham Palace. Shang-Chi pursued him, and found the real Dr. Petrie being held with Smith. Aided by Clive Reston, Shang freed Smith and Petrie and Fu fled again. 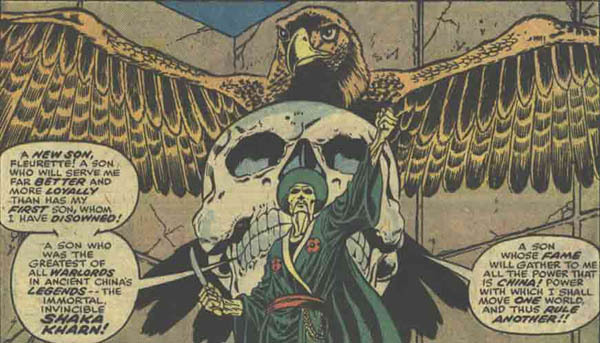 (Master of Kung Fu I#26) - Fu Manchu journeyed to El-Kharga in pursuit of Fah Lo Suee, who sought the Golden Beetle buried within the burial crypt of Seth-Amon, recently discovered by Robert Greville. Fah Lo Suee managed to steal the item, narrowly escaping a bomb set by Fu Manchu that destroyed the tomb. (Master of Kung Fu I#27) - Fu Manchu held a meeting of the Council of Seven in which he revealed that Fah Lo Suee had a rival faction of Si-Fan in opposition to him. They were interrupted by Shang-Chi, who bested the Seven. He and Fu Manchu then discussed their differences, and Fu claimed that from his perspective, it was Shang who was evil and he was disappointed in his son for not allying with him. He gave Shang an opportunity to kill him, but Shang declined, and they parted without any change in their relationship. (Iron Man I#74 (fb)) - Fu Manchu received an audience with the Black Lama, who offered him an opportunity to compete for the Golden Globe of Power, but Fu refused, and demanded that the Black Lama depart at once. Afterward, he remarked to one of his servants that the Black Lama's plan was transparent as glass. The servant was actually A.I.M. agent Q5-L2, and she related this to A.I.M. 's leader MODOK. (Giant-Size Master of Kung Fu#4) - Fu Manchu learned that Tiger-Claw was robbing a number of banks, believing that in the struggle between Fu Manchu and Fah Lo Suee, he should strike out to build his own power base. Fu dispatched Si-Fan to deal with him, but they were all beaten by Tiger-Claw and Shang-Chi. Shang defeated Tiger-Claw, halting his plans. (Deadly Hands of Kung Fu#31) - Fu Manchu was contacted by the Corporation, who sought an alliance with him. He refused them, causing them to commit suicide in despair. (Master of Kung Fu I#42-43 - BTS) - Fu Manchu employed the brainwashed Petrie and special agent Shockwave against MI-6 and Fah Lo Suee's Golden Daggers sect, but Shockwave was defeated by Shang-Chi. (Master of Kung Fu I#45-50) - Fu Manchu schemed to knock the moon out of its orbit in order to unleash chaos throughout the Earth, giving him an opportunity to lead mankind under his rule. He revived his ancestor Shaka Kharn with the Elixir Vitae, and fought MI-6 and Fah Lo Suee. Shang-Chi confronted his father aboard a ship bound for the moon, and Fu Manchu was shocked when Shang shot him with a gun; lurching forward, he was electrocuted by sabotaged controls, and wound up sealing himself within his ship's escape shuttle. The shuttle launched into space, seemingly consigning him to his death among the stars. (Master of Kung Fu I#82 (fb)) - Fu Manchu's shuttle crashed in South America, where he was found by a tribe who had made no contact with the outside world before. He became their master, and summoned the Si-Fan to help him set up a new power base in the jungles, training his new followers into the Leopard Cult. (Master of Kung Fu I#71-79 - BTS) - Believing that Fu Manchu was still alive, MI-6 turned on Shang, Smith, Wu, Reston, and Tarr, thinking that they had covered up his death. Fah Lo Suee used the opportunity to takeover MI-6 with the aid of her lover, Maximillian Zaran. (Master of Kung Fu I#80-81, 83-86, 88-89) - Fu Manchu brought the Si-Fan, Phansigars, Thugees, Hashishin, Templars, Leopard Cult, Light-Seekers, Followers of the Left-Hand Path, Three-Cornered Sight, and Twenty-Third Sect to his South American base, and combined their ranks into the Order of the Golden Dawn. He had representatives of the U.N. brought to him and given mind control devices so that they could initiate acts of destruction in their home countries, starting World War III. He also employed "UFOs" with genetically-engineered "aliens" to sow chaos. 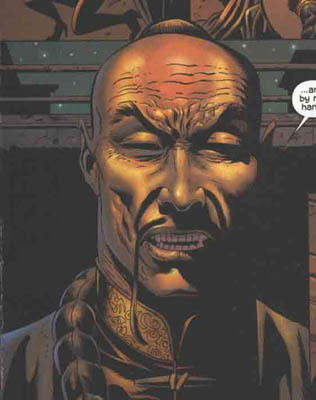 Fah Lo Suee seemingly returned to serve her father, but proved to be disloyal yet again, providing aid to Shang-Chi, Nayland Smith and their allies. Shang-Chi confronted Fu Manchu in New York as he was preparing to detonate a nuclear bomb, and he fought his father aboard a "UFO," savagely beating Fu and then smashing the ship's controls, sending it to crash in the ocean, seemingly killing Fu Manchu. (Master of Kung Fu I#115-118) - As tong leader "Wang Yu-Seng," Fu Manchu sought to kidnap Fah Lo Suee and Shang-Chi to jumpstart the Elixir Vitae, which now needed the blood of his own offspring in order to restore him to full vigor. With the help of Death-Dealer he captured Shang and intended to hold him hostage and slowly drain his blood, but Shang escaped. He brought Fah Lo Suee to Honan to have her blood, but Shang pursued him. Fu Manchu unleashed a clone he had made of Shang and raised as his own son, but Shang bested him, and the clone was killed. Fu Manchu attempted to lap up the clone's blood to save his life, even as the fortress crumbled around him. Shang-Chi left his father to meet his doom. (Captain America I#412 - BTS) - Determined to rid the world of his father's stain, Shang journeyed to A.I.M. Island to determine what his father's connection to that organization was, but his findings were inconclusive. (Marvel Knights I#4) - Fu Manchu employed Zaran to retrieve a chemical from A.I.M. He then directed Zaran to kill Shang-Chi for him. (Marvel Knights I#11-14) - Fu Manchu dispatched his Dacoits to aid Zaran against Shang-Chi and his allies. They succeeded in destroying the building where Shang and his friends had made their base, but Zaran failed to slay Shang. (Master of Kung Fu II#1-6) - Using the aliases of Comte de St. Germain and "the Ghost," Fu Manchu employed his son Moving Shadow as he prepared the Hellfire weapon, a lightning ray which could destroy entire cities. 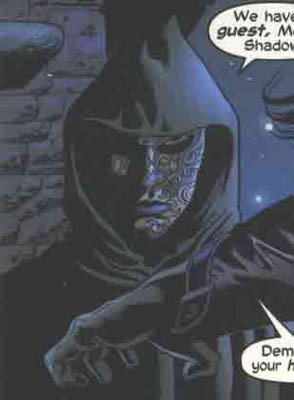 He was opposed again by MI-6, including Shang-Chi, and ultimately his weapon was destroyed. (Black Panther IV#11) - Calling himself "Han," Fu Manchu offered his daughter Kwai Far to the Black Panther as a prospective bride, but T'Challa refused him, and drove him off alongside Shang-Chi and Luke Cage. Comments: Created by Sax Rohmer. Adapted by Steve Englehart, Jim Starlin, and Al Milgrom. Post-Master of Kung Fu I#125, Marvel comics has no longer been able to publish stories with Fu Manchu's name, but have continued to grant him occasional appearances sans his true name. Note that "Fu" and "Manchu" are both surnames; this is intentional. Rohmer originally wrote the name as "Fu-Manchu," but it was intended as an alias. However, Fu Manchu has claimed to be descended from China's Manchu dynasty (like many of the Si-Fan). Note that in his earliest appearances, Fu was given a sickly-yellow skin coloring; by the time of Master of Kung Fu I#80, he was rendered in a flesh tone nearer to his son. It's mark of how far coloring had come...not to mention racial sensitivity. Fu Manchu delivered a lengthy speech to Fleurette in Master of Kung Fu I#47 even though she wasn't there. Since he was speaking about the betrayal of Shang-Chi, it might be that she was Shang's mother. Jean-Marc Lofficier suggested Fu Manchu was one of the "Immortal Nine" in an unpublished script. Fu Manchu could mean "Father Pure"--one of the Mandarin words FU means "Father"; and MANCHU means "pure" according to both Funk & Wagnalls Standard Desk Dictionary (1976) and The Oxford English Dictionary--second edition. As for his alias the Ghost in Mandarin it is GUISHEN. Because this profile is about the Marvel comics interpretation of Fu and there have been hundreds of other interpretations and dozens of imitators, this section will be kept brief. Visit The Page of Fu Manchu for more. Sax Rohmer's novels are treated as in-continuity (unless proven otherwise) for the sake of the Marvel Universe, based on in-canon references to events from novels such as The Daughter of Fu Manchu and Emperor Fu Manchu. Rohmer enthusiasts have established much more detailed timelines of Fu Manchu's life based on their own research; I've chosen to list the events of Rohmer's stories by the year in which they were first published, as the world of Earth-616 need not necessarily obey the timelines of the novels. Plus, it's way simpler.